The rollercoaster continues as we enter the weekend after a week that featured both snow-cover and highs in the 50s. We’re not done yet as Friday will see the frigid start to an up-and-down weekend. Yes, we’re starting off with gelid continues outdoors, with temperatures just barely above single digits this morning. A cold front slunk through the area last night making temperatures fall faster than me at an ice rink. And, also like me at an ice rink, they’re not going up any time soon…well today, anyway. High pressure is large and in charge today, which means sunny skies and cold temperatures. Highs this afternoon will struggle, even under full sunshine, to crack the 30º mark. Afternoon readings will top out around 25º, with wind chill values struggling to even reach 10º with brisk northerly winds. Yes, 10ºF. We might see light snow impact the region tonight. Models are hinting at the possiblity of a weak clipper system moving southeast over the area. Should this come to fruition, travel conditions may be slick late tonight through early Saturday. Southwesterly winds bring in cloud cover overnight ahead of another weather system to affect us during the weekend. Lows don’t fall that much, only to around 21º. Conditions Saturday will be much improved, with partly sunny skies to start off the day. Southwesterly winds will be ushering in slightly warmer temperatures but with the trade-off of more cloud cover…and yes, eventually rain chances. Highs Saturday afternoon top out in the vicinity of 45º. We can’t rule out a sprinkle in the afternoon as a weak system tries to squeeze a few showers out. We cool nicely overnight, so we can’t rule out a couple of those showers being the form of snow…but not looking at anything significant. 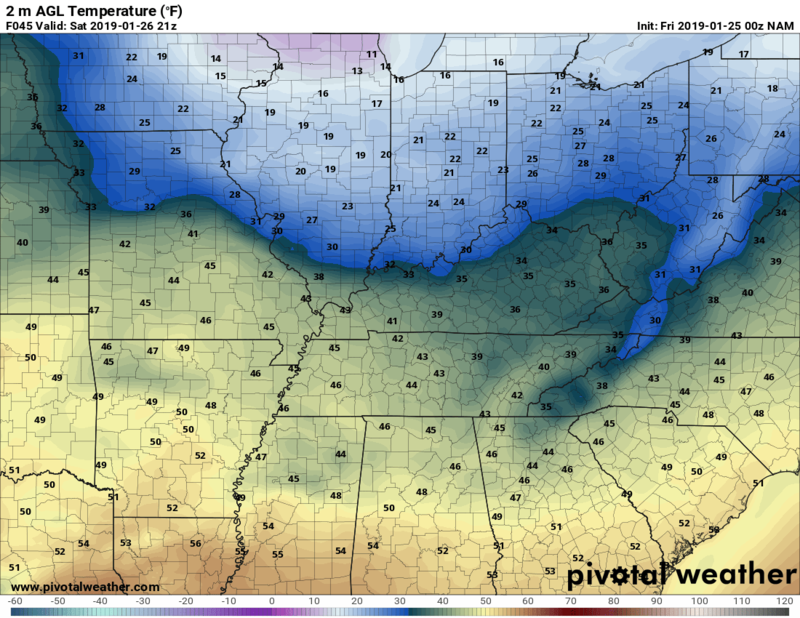 Lows around 30º. We keep the clouds around during the day on Sunday as a disturbance sticks with us to close out the weekend. This particular weather maker may throw a few rain and/or snow showers our way. Don’t worry about any significant impacts with this one…other than some wet roads. Cloudiness keeps us around 45º or so for an afternoon high. We keep clouds around overnight, and fall to a low of 30º. After the weekend, things get active with multiple storm systems making a run at the region along with a return to bitterly cold temperatures. Monday and Tuesday in particular are going to feel familiar with mild temperatures crashing back to wintry reality. Could make for interesting times heading into February. We’ll, of course, keep an eye on it.